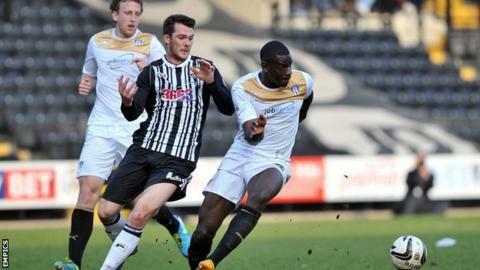 Notts County striker Jimmy Spencer has signed a two-year contract with the League One club. Spencer joined on a short-term deal in February and scored five goals in 13 games to help County avoid relegation on the final day of the season. The 22-year-old told BBC Radio Nottingham: "I wanted to get it done as soon as I'd finished the season, but it's done now. "I'm happy, the club seem happy and I can look forward to next season." He added: "It's actually been going on for a while, since the back end of last season so it feels like it's dragged on a bit." Captain Alan Sheehan, Gary Liddle, Jamal Campbell-Ryce, Kyle Dixon and Jeremy Balmy have also been offered new contracts by the club.